It has been a few months since the cricketing world witnessed the infamous "Sandpaper Gate" incident during the third Test between South Africa and Australia. The ball-tampering scandal led to Steve Smith, David Warner, and Cameron Bancroft receiving lengthy bans from playing international cricket. Former Australian cricketer Justin Langer, who is currently the head coach of the Australian side, opened up about his initial reaction to the incident while watching it on TV with his daughter. "It was three minutes to nine Perth time and (Langer's daughter) Gracie wants to go to bed and I flicked on the tele, because we'd been out somewhere," Langer was heard as saying on The Howie Games on PodcastOne on Australia's Channel Nine. "Just before the break they had this replay and all I could see was this hand with something, which was obviously sandpaper, and I recognise the hand cause Cameron Bancroft has got really big hands. "And Cameron Bancroft is literally like one of my sons ... one of my boys! And I said to Gracie 'pray that isn’t Cameron' and she said 'what do you mean, Daddy?' And I said just pray that it's not Cameron," he continued. 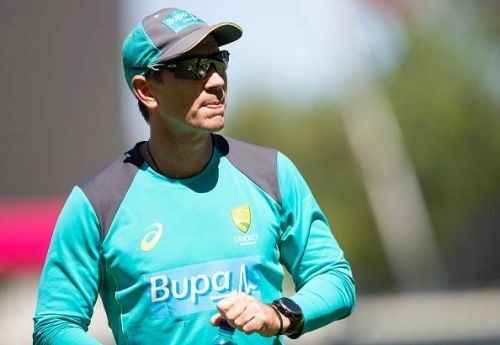 Langer also went on to say that he felt extremely angry and disappointed with the entire incident and felt that it was a sad day for Australian cricket. He was appointed the coach of the national team in May 2018. However, he has faced a lot of difficulties with the absence of two of the biggest stars of the side. After losing the Test series to South Africa, the Kangaroos got hammered by England in the ODI series. Shortly after that, they lost out to Pakistan in the final of the T20I tri-series which was held in Zimbabwe. They will now take on Pakistan in a Test series which begins on October 7.